Third Planet Windpower (TPW) and Omaha Public Power District (OPPD) celebrated the addition of more wind power to OPPD’s generating portfolio by commissioning a new Petersburg wind project on Monday afternoon, Oct. 31. Several speakers noted the TPW Petersburg project resulted from nearly five years of cooperative effort between the community, OPPD, Nebraska Public Power District and TPW. 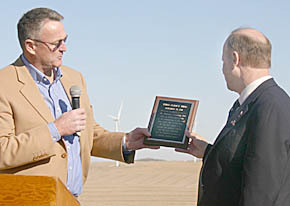 The ceremony was held overlooking the wind farm at the Joe and Joyce Temme farm (Jeff and Jan Temme residence) five miles east of Petersburg. The project has 27 GE turbines and will supply 40.5 megawatts of electricity, enough to provide the electric needs of about 12,000 homes each year. Energy from the Petersburg wind project will be sold to OPPD and distributed to their customers over the next 20 years. Nebraska’s top two executives, Gov. Dave Heineman and Lt. Gov. Rick Sheehy, were on hand for the ceremony, as were representatives of OPPD, NPPD and other community leaders.